Since 2010, green and white trains of the Vogtlandbahn, a private railway company, have run under the name of trilex on the route between Seifhennersdorf, Rybniště, Zittau and Liberec. The first connotation associated with the prefix "tri" was the border triangle. 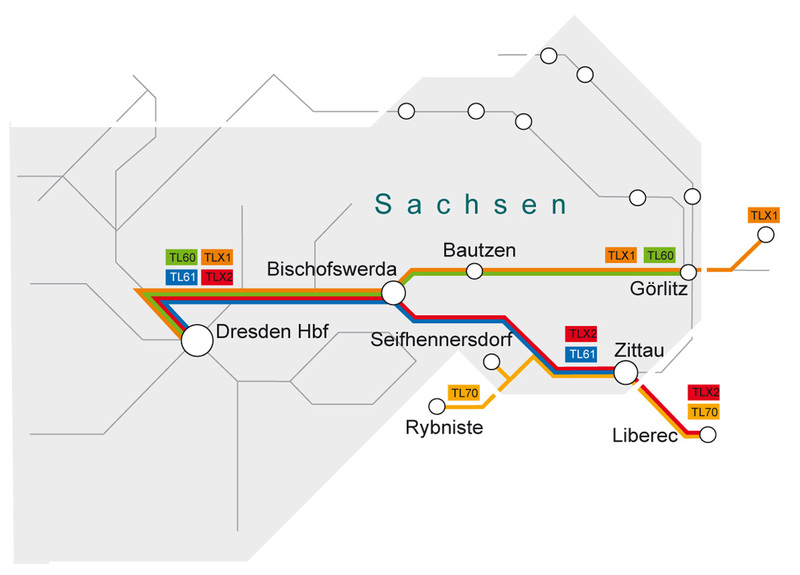 With the extension of the trilex rail network, however, "tri" also stands for three regions: Since the timetable change in December 2014, the trilex has connected the Dresden Elbe Valley with Upper Lusatia and the upper valley of the Neisse river all the way to Liberec, thereby also connecting numerous partners of the Steam Railway Route. So the trilex has replaced the Regional-Express (RE) and Regionalbahn (RB) trains in East Saxony, running as trilex express (TLX, stopping only at selected stations) and as trilex (TL, stopping at all stations). Modern railcars carry passengers safely and comfortably to their destinations on all lines. The regular fares still apply to the trilex transport association: the ZVON fare, the VVO-ZVON- transition fare for season tickets or the VVO fare (within the respective validity period and area). If you are planning to visit the cities of Bautzen, Görlitz or Zittau or hike in the romantic Zittau Mountains Nature Park, it is just a short hop by trilex into these places. So, in addition to the existing offers of the linked transport systems, two new tickets are available for trans-network train journeys on the trilex: first, the "Katzensprung" (short hop) ticket for journeys from Dresden to the surrounding area and, second, the trilex day ticket. For excursions within the ZVON network area - with an additional use of buses and trams - you can still use the ZVON day tickets. For journeys to the Liberec Region, we recommend buying a EURO-NEISSE ticket (see also page 74). This ticket is valid not only for rides on various other rail and bus lines (including those in the Czech Republic) but also, among others, for rides on the Liberec-Horní Hanychov–Ještěd Aerial Cableway and the Zittau–Oybin–Jonsdorf railway (plus an extra history fee). Whether you plan on going on a sightseeing trip to another city, a hiking tour or to one of the partners of the Steam Railway Route, our trilex team will be happy to advise you on the best ticket for your journey. In addition, you can purchase your train ticket at the DB Bahn agencies in Bischofswerda, Bautzen, Löbau, Görlitz and Zittau. For more information please visit our website at www.trilex.de or call our Customer Service hotline at +49(0)89 548 8897-24. You will also find all trilex line timetables on our website. No matter if you travel by trilex or trilex express, the train driver is not the only important train crew member. On board every train, a trilex conductor will gladly provide advice or assistance to you. For example, should you not yet have bought a ticket or are not sure which one to buy, you can purchase one directly from the train conductor at no additional charge. Our conductors can also recommend other destinations in Saxony or Germany and sell you the ticket on the train. For commuters, we offer an extra service: subscription season ticket holders have the option to reserve a regular seat for their daily return trip on a selected train. Daily newspapers will be provided for them, too. For further information please visit our web page: www.trilex.de/stammplatz. Die trilex Bahnen fahren täglich. Katzensprung-Tickets berechtigen zu beliebig vielen Fahrten am Geltungstag auf der gewählten Strecke. In trilex-Zügen beim Zugbegleiter, trilex-Agenturen, DB-Verkaufsstellen (Reisezentrum, Agentur) oder DB-Fahrkartenautomaten. Weitere Informationen zu Gültigkeit und Preisen finden Sie unter www.trilex.de/tagestickets.